Today is my 23rd wedding anniversary. My husband sent me a lovely bouquet of flowers and here is one of them. I was just remembering this poem, so here it is, in honor of the occasion. Congratulations Enid. I pray you have many many more if the Lord tarries. Are those peach colored roses? gorgeous and so delicate and soft looking. 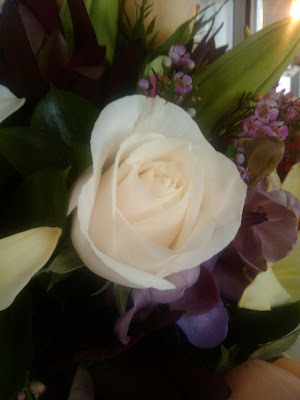 Elsie, he sent orange roses and creamy white roses, 23 of them, one for each year we've been married. I know I don't deserve this man; I am so blessed! Thanks for looking. Love the beautiful flowers, and love the familiar love poem. Have another great year ahead of you. Enjoy the 23rd year of being married!